So, I suppose that’s a kind of achievement. The big Ka-blammo – at last! It’s pretty clear that we’re near the end now readers (I hate it – I hate it!) – but I have other plans. I’m still seriously considering doing this all over again with the hundreds of other drawings that are in the attic. God, I’m nuts. That’ll be one hell of a project. (Maybe I should think more about actually earning a decent living…). Yep, retirement project methinks. What the..? Solo seems the break some sort of wall here—into our own time and Galaxy. I’ve previously mentioned the occurrences of Hell and «Holy Shi- in the comic but Christ? Now, when I was growing up there was no really foul language in our house. Unless you count the occasional dog-fouling-the-lawn inspired exasperated yells of my dad: “Jesus Christ—there’s bloody shite all over the front lawn!” Shite? SHITE? Did dad really say that? Most unusual. Not today of course. Shite is pretty mild now. A bit like—but still worse than the Irish Feck as made globally popular and acceptable by Father Ted. Anyway, dad probably should say shite. After all, he is a Liverpudlian. Nay: he MUST. It is his duty as a Scouser. Congratulations Luke, you just killed thousands of people and what’s that? You hear voices in your head? V o i c e s. And you’re getting pretty used to the death thing now right? Uncle and aunt dead: sad for a few minutes. Death Star and its entire population dead: Whoo-hoo! Ok, we’ll let you have the last one without judgement. It was mass murder, but they were very BAD people. And it was them or us right? Self-defence. Do you know: that’s possibly the first occurrence of bullet-points on Star Wars age 9? It’s a good thing I didn’t think of doing that two years ago or the whole site might have ended up looking like a Powerpoint presentation. Total and utter daftness awaits you—until we reach the second last page of this epic. 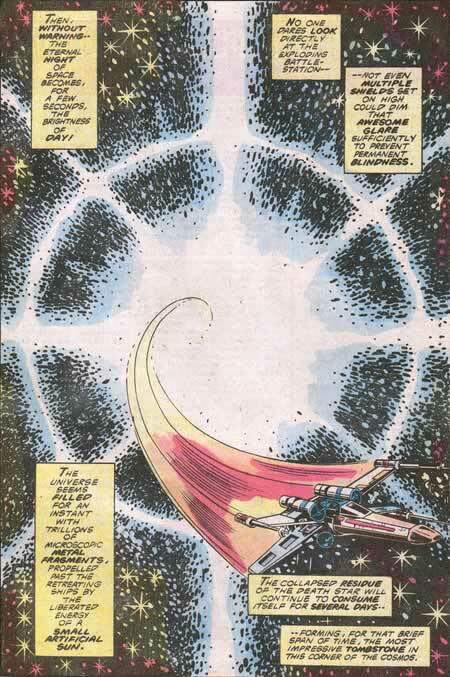 As I said, this page is copied directly from Marvel’s version? Amazing but true. I copied them—not the other way around. Sad, I don’t remember that panel at all. As for foul language it must have been quite a shock then listening to ‘one man and his dog’ around the 90 acre field at the back of your house. Yours and the Marvel version seems more appropriate to the magnitude of the situation! If I saw the Death Star explode, I’d say wow too! Nice, this one should be your promo poster! Where’d you come up with the “most impressive tombstone” part? 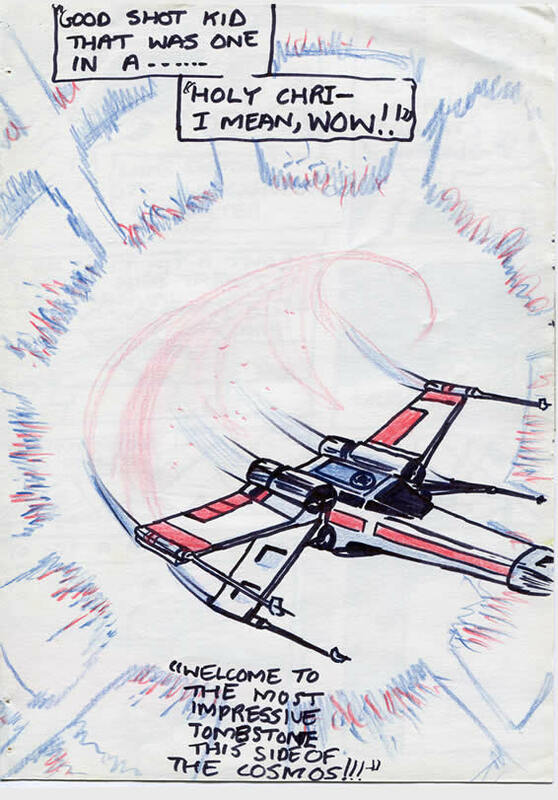 Rather profound for a 9 year old’s comic, nevermind the whole Star Wars franchise! And you could sell t-shirts of this panel to finance the next comic project. The red & blue give it an old-school 3-D effect (yes, I tried it with glasses). Hi Scott – the credit for that would go to Roy Thomas! – I think it’s in the Marvel version. T-Shirts? I think I might experience the wrath of George if I did that. Assuming he still remembers this definitive original version of the story which he adapted into a movie – with some success many years ago. In a stunning moment of fractual coincidence, the Death Star explosion resembled a simple bacterium as seen through an electron microscope. I’m sure future scholars will be endlessly discussing this one day. Probably. I don’t know if you ever read all 6 of Frank Herbert’s DUNE novels? The very last chapter of the 6th (yawwwwwn) book had a touch of that. God knows how I ever got through the last 3 books. Couldn’t read past the first book. The first was very good I thought. The second was quite good. From 4 onward, it was mostly boring emotionless people sat around having long boring emotionless discussions about politics. I always thought Phantom Menace had pretensions towards being like DUNE. This one just strikes me as really awesome and professional looking. Very nice. Wish I could claim the credit! Tom, your premonition of someone reconstructing a star wars movie hundreds of years on from nothing but this comic is the most tantalising idea raised in this site’s comments!